Hi everyone!! Following on from my 'Whats in your wardrobe?' 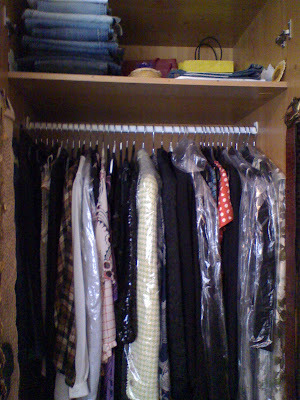 post back in June, I was inspired by the lovely Kate of Make Do Style when she wrote this excellent post -'Size matters(2)' regarding an overstacked wardrobe and the concept of 'Slow Fashion'-this is a must read, after you've finished here of course, LOL!! Basically, because of the summer holidays, I've had time to re-evaluate my wardrobe with autumn looming and also to sell more items, including ones that I had acquired during my 'Buy on Ebay when I'm bored' habit. I've also passed on some more unwanted pieces to the charity shop to make way for recent thrifting purchases that will provide longevity in my wardrobe. 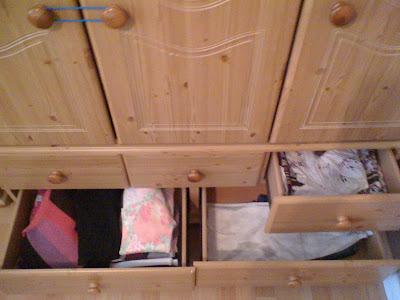 This is my wardrobe after my main sort out, the top wardrobe houses my favourite tops, jackets, dresses, jeans and handbags at the bottom. 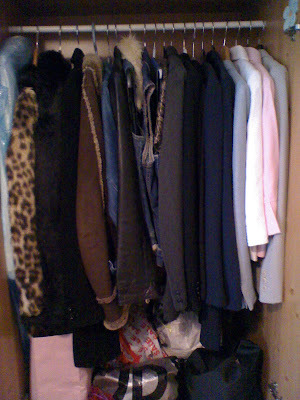 This wardrobe has my winter and summer jackets and coats and remains mainly unchanged from last time. 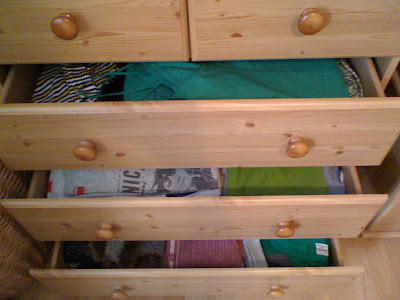 These are the remaining drawers of clothes, which have summer dresses, tops and tees, woollies (cardi's and jumpers), summer skirts and blouses. I still haven't found red shoes I like enough to get yet. I've acquired a few black pieces in my wardrobe these past couple of months, notably a black pencil skirt, my black vintage Thierry Mugler jacket, black bodycon woollen Benetton dress and some gorgeous black heeled knee high leather boots. I've learnt 'for me', that less is more-I like to look at a glance to see what I've got and be appreciative of the gorgeous pieces I've acquired over time. Some do not get worn for a while, but will have a long term place in my wardrobe. What is your wardrobe philosophy? OMG! I'm jealous! YOU are sooo organized! My closet is a total mess, why it takes me forever to find things! Now that I have seen your closet I'm inspired to organized mine too, of course it's going to take me the rest of the Summer to do so! PS: My wardrobe philosophy is mixing the new with the old and wearing fab soles! this makes me want to clean my closet up a bit more!! ah! I so admire your tidy, organized wardrobe ... but I've gotta say I prefer to have LOTS of options, myself! lol I wish I could show you my wardrobe!! I need a wardrobe revamp! My closet is a disgrace right now! Congrats on your beautiful job. ok, now you've made me feel bad. I wish I was this organized! I think "Less is More" is a great philosophy and I'm trying to follow it too! Your closet is an inspiration, Sharon! Your first pick looks uber sophisticated! Brilliantly organised. You are amazingly organised. I have one built in wardrobe which is bursting! I don't have room for a chest of drawers so I'll need to think about re-evaluating what I do/don't need! I'm trying to get one of my kids to move out so I can take over their bedroom as a closet LOL! OMG...you have so many collection!! i'm so jealous with you!!!!!! My wardrobe philosophy? Buy great things, keep them forever, never worry about what I "should" have or "shouldn't" have. I've regretted not buying/giving away things more than I have buying/keeping things. I used to weed out my closet a lot when I had junk clothes...with great pieces, you don't have to do that! Hi there-fabulous comments, thanks so much-its great to hear everyone else's perspective of what makes a great wardrobe!! great closet organisation honey, Sharon your wardrobe is in great order! I wish I could adopt your lovely less-is-more philosophy... I just keep wanting fabulous new dresses and I never get rid of anything! Hi Miss Peelpants-Oh I have wardrobe envy for yours, LOL!! Sharon, I'm also trying to reorg alittle bit. Since my son has moved out I now have this room to convert into a office / closet. That helped me out big time or else I would have had to purge even more then I already have. Hi budget chic, its great that you have some space to do this now! !